Reflections on Auckland Planning: New Orleans: French or Spanish? I spent a wonderful week in New Orleans in May 2018. This posting reflects the little learning I picked up while there about the urban morphology of the French Quarter part of New Orleans in particular. I was there to immerse myself in local music - blues, soul, jazz - but there's so much more to experience and learn about here. (You will see my other post here about Katrina.). Although New Orleans’ early residents were indeed French, the architecture of the French Quarter is actually Spanish. To pay a war debt, France gave up control of Louisiana to Spain, who controlled the colony from 1763 until 1803. Several fires destroyed the original French architecture of the Vieux Carré during Spain’s forty-year rule of New Orleans, so the charm presently found at the heart of New Orleans can be credited to the Spanish from when their administrators rebuilt the city. The flat-tiled roofs, tropical colors, and ornate ironwork of the French Quarter are Iberian touches brought from across the Atlantic. In order to prevent fires, the Spanish-controlled government mandated that stucco replace wood for construction material and that all buildings be placed near the street and near each other. 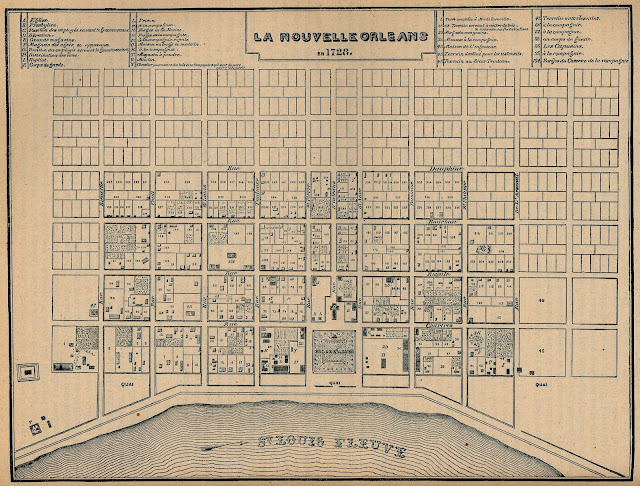 Where there used to be yards and open spaces surrounding buildings, the French Quarter was now rendered both more intimate and more secretive, with continuous façades, arched passageways, and gorgeous rear gardens and courtyards hidden from street-view. By the time New Orleans was transferred from French to Spanish control under the 1763 treaty of Paris, it could boast a bastioned enceinte (surrounding enclosure), though it lacked the ditch, glacis, and outworks that would have made it possible to resist an attack by artillery. As with many fortified places, each bastion was identified by a name. Pittman’s plan was drawn to provide information to British forces that had recently taken possession of neighboring West Florida. It is information like this, which can be pieced together from books and museum exhibits, that enable visitors to build up a picture of how this rather wonderful and interesting city came about. 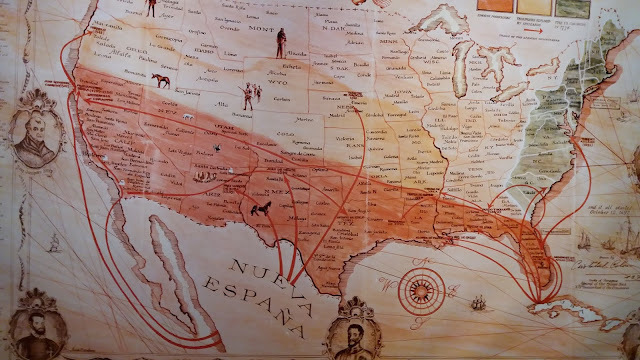 An extraordinary mix of French and Spanish colonial history, with a smattering of local Creole, and a background of New Orleans being a centre of the black slave trade. 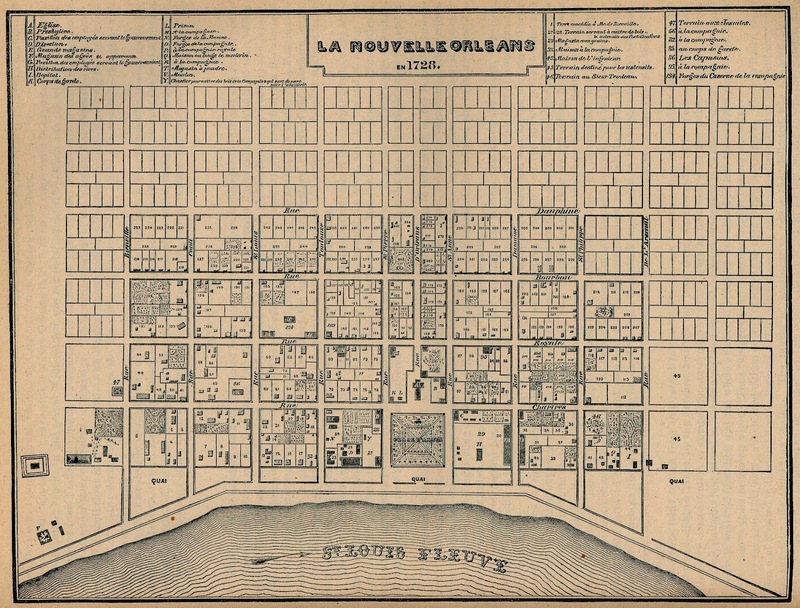 The shape of the original "French Quarter" is clearly visible. 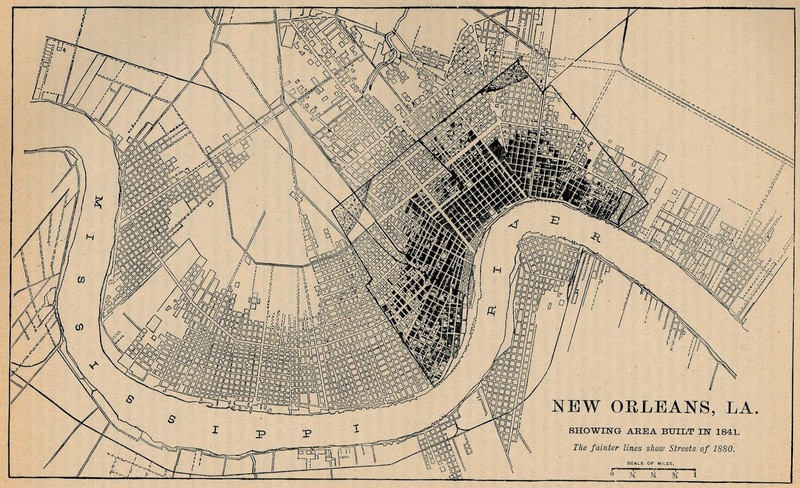 Then on either side similar street layouts are visible as New Orleans expanded - with the dark areas being built in 1841. The fainter lines show the new street networks planned by 1880.